Whether you prefer prime classic patties or creative, gourmet toppings, Boston caters for every taste when it comes to burgers. With the burger still being one of America’s favorite fast foods (next to pizza), the jury is out on who makes the best burgers. 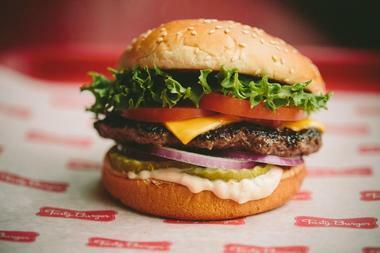 Boston’s burgers range from signature versions of the meal, such as aioli and taleggio-topped burgers at places like Rialto, Lineage, and Eastern Standard, to affordable classic bites from Mr. Bartley’s Gourmet Burgers, a fast-food legend since the 1960s. 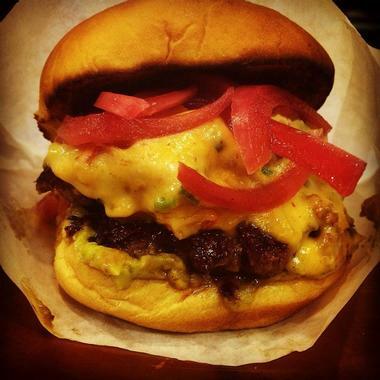 Boston Burger Company is a casual American restaurant located in Boston, Cambridge, and Somerville that serves creative burgers, gourmet fries, and an outstanding selection of craft beers. Also on the menu is a range of appetizers, sandwiches, and freshly prepared salads, accompanied by made-from-scratch dressings and sauces. Delectable burgers can be made with turkey or veggie patties and are served with homemade potato chips, baked beans, or coleslaw. 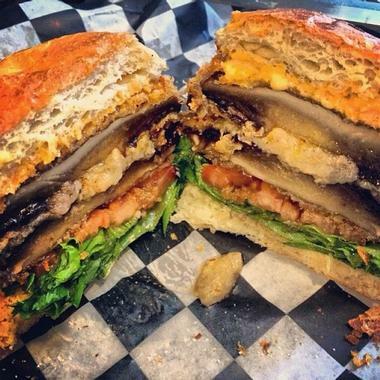 Signature burgers on the menu include The Sophie, which is stacked with goat cheese, prosciutto, fig jam, candied walnuts, arugula tossed in lemon vinaigrette, and balsamic reduction, and the Whiskey Tango Foxtrot with succulent pulled pork, onion rings, mac & cheese, pickles, and barbecue sauce. 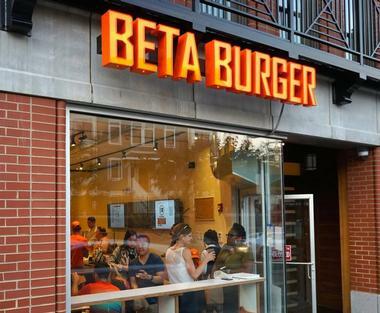 Founded in 2014 by Adrian Wong and inspired by small tech startups that give corporate giants a run for their money, Beta Burger is a unique technology-driven burger joint that allows customers to create their own delicious customized hamburgers, fries, and drinks. 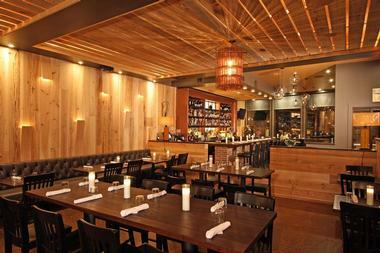 Located just a short walk from Boston’s historic Fenway Park, Audubon is a friendly neighborhood restaurant and bar that serves a seasonal menu of creative cuisine along with an revolving beer list and a variety of handcrafted cocktails. Boasting a modern yet comfortable indoor space and a sunny outdoor patio for alfresco dining, Audubon is open for lunch, dinner, and brunch on Sundays. The menu features a range of appetizers and sharing plates, fresh salads, sandwiches, burgers, and other dishes such as Bolognese, porchetta, and grilled flank steak. 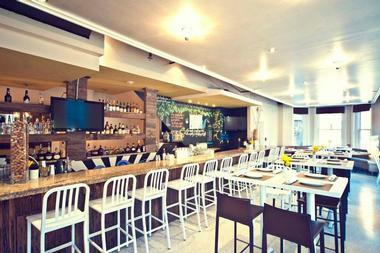 The cuisine is accompanied by fine wines, craft beers, and a selection of handcrafted cocktails. 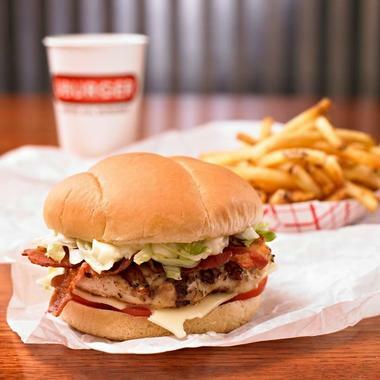 UBURGER can be found in four locations around the city and serves made-to-order burgers with delicious toppings, hand-cut fries, freshly prepared salads and sweet treats. Co-founders Nick Kesaris and Spiro Kouvlis founded the flagship Kenmore Square location in 2001, which fast became a neighborhood fixture among students, locals, and Red Sox fans. Burgers are made with antibiotic and hormone-free Angus beef patties, freshly baked buns, and crisp salads and are offered in classic variations or as “make-your-own” types. Burgers are accompanied by signature frappes, which are a heavenly blend of ice cream, milk, and syrup, to provide a decadent dessert. 5 Napkin Burger is a unique eatery that specializes in burgers and tacos and everything in between. Catering to those with the most discerning appetites, the family-friendly restaurant chain offers a rare mix of classic and innovative burgers, freshly made tacos, grilled tuna salads, and a variety American fare. Both carnivores and vegetarians are welcome and the food is paired with a selection of local lagers and beers, handcrafted cocktails, and easy-drinking wines, all served in a casual, bistro setting. 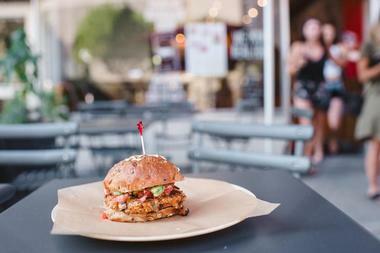 Offering a one-of-a-kind burger adventure, 5 Napkin Burger provides a laid-back eating experience for all. b.good is a counter-serve chain that operates five locations around Boston (Boylston, Dartmouth, Summer and Washington streets, and Mass. Ave) as well as stores further afield that serve health-conscious versions of fast-food favorites such as baked fries, kale and grain bowls, and seasonal veggies. All ingredients are locally and sustainably grown, ranging from grass and grain-fed beef and chicken to fruit, herbs, salads, and vegetables. 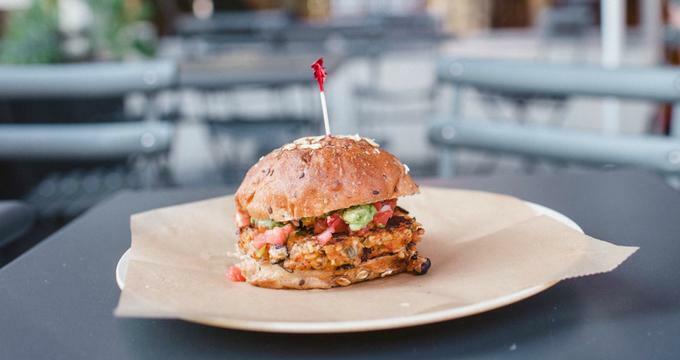 Burger patties are made with naturally reared beef, turkey, chicken, or fresh vegetables and spices and boast toppings of avocado, bacon, chipotle puree, caramelized onions, and Chef Tony's homemade pickles. Healthy substitutes include gluten-free buns and crisp veggies. Founded over 40 years ago, Charlie’s Kitchen is a family-friendly restaurant and bar that serves a broad range of delicious made-to-order food and beverages. The 50’s-style diner is spread over multiple levels and features quirky, eclectic décor reminiscent of a bygone era, with an upper lounge housing the “the best jukebox in Cambridge” and several large-screen televisions. The menu features appetizers, soups and salads, hearty burgers and sandwiches, fresh seafood, and decadent desserts along with a full service bar and beer stand with 18 draught beers. Diners can enjoy weekly entertainment such as karaoke, live music, and the special Sunday Night Pub Quiz. 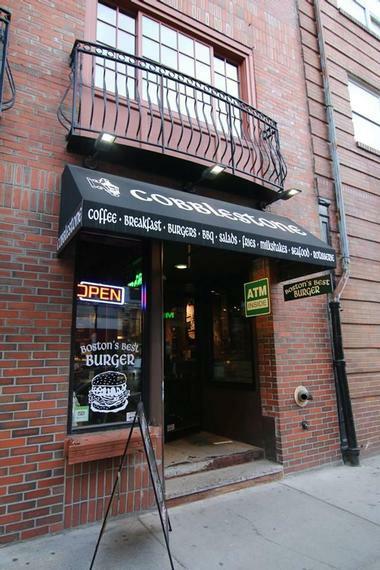 Cobblestone Café is a casual bistro-style diner that serves freshly brewed coffee and light fare, including some of Boston’s best burgers. 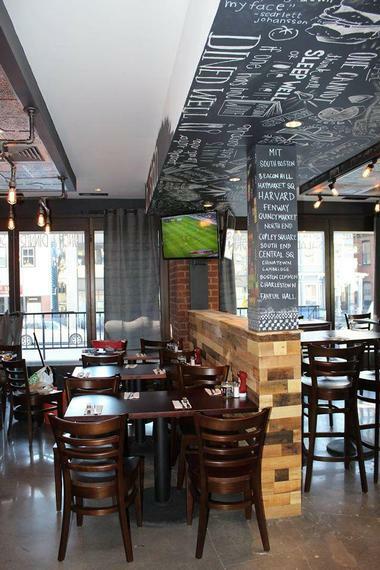 Owned by Antico Forno and Terramia Ristorante’s Carla Gomes, the Cobblestone Café is a new addition to North End’s famous Hanover Street and offers a creative menu of innovative cuisine, including breakfast burritos, New England lobster rolls, and pulled barbecue pork. 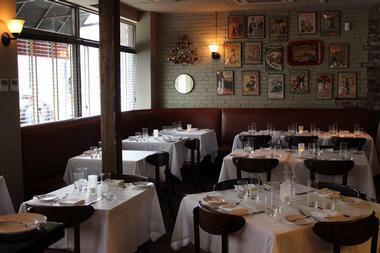 Owned by “snout-to-tail” pioneer and chef/proprietor Tony Maws, Craigie on Main is a refined yet rustic culinary hot spot in Cambridge, Massachusetts, that offers award-winning Franco-American creations. Using the best local and organic ingredients for his inspired dishes, Maws presents an array of seasonal à la carte choices and an eight-course tasting menu with special plates such as hiramasa sashimi salad, rhubarb-hibiscus mousse, and crispy-fried Florida frog legs. Sunday evenings offer an affordable four or six-course tasting menu and the towering grass-fed beef burger, which can’t be found on the menu, is hailed as being the stuff of legend. Renowned or its excellent burgers and sandwiches, Flat Patties serves an array of made-to-order American fare in a casual, laid-back setting. Located on Brattle Street in Cambridge, Flat Patties’ burgers use freshly ground beef and newly baked buns topped with crisp salads and a variety of delicious toppings, including fried egg, blue cheese, bacon, and barbecue sauce. Signature burgers include the “South of the Border” burger with avocado, Jack cheese, jalapeño relish, and cilantro aioli, and the ‘Sunday Morning” burger with fried egg, ham, and smoked tomato jam. Burgers are served with hand-cut fries and a range of sauces and can be enjoyed in the comfortable dining area or taken away to be savored at home. Grass Fed JP is a bustling, vibrant café with communal tables that specializes in grass-fed burgers, sandwiches, and mouthwatering milkshakes. Using only beef raised naturally, without antibiotics or hormones, and soft potato buns freshly baked every day from the local Blue Frog Bakery, Grass Fed’s burgers are some of the best in town. 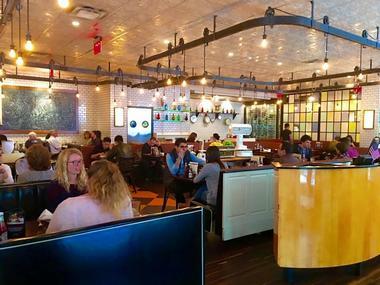 Sited at two locations in Jamaica Plain, Grass Fed JP features classic and specialty burgers, hot dogs, salads, sandwiches, and decadent desserts. Specialty burgers include “The Cali,” which is stacked with pepper jack, mescaline, spicy avocado spread, red onion, and cilantro-lime mayo, and the “The Blue Devi” with bacon, Stilton blue cheese, crispy onions, and mayo. 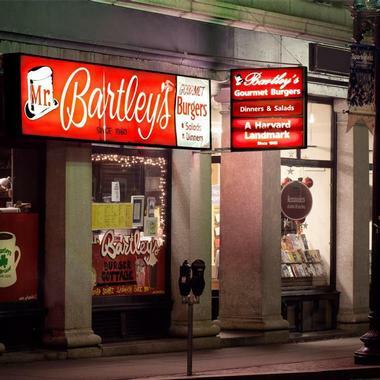 Cluttered with memorabilia dating back to the 1960s, when it was first established, Mr. Bartley's Gourmet Burgers is a Harvard Square institution and a student favorite that serves thick, juicy burgers, chunky fries, and gourmet milkshakes. Boasting kitschy décor in a small and cozy space, Mr. Bartley's serves over 30 different kinds of burgers named after local and national celebrities. Burgers include the “hot” Beyoncé Burger with bacon, grilled onion, jalapeño, hot sauce, and fries, and the Next President “God Help Us” Burger with cheddar cheese, guacamole, red onions, and tomato. The Hashtag (don't tweet it just eat it) has bacon, Boursin cheese, and sweet potato fries. R.F. O’Sullivan & Son is a casual, bare-bones tavern and burger spot that is high on the list when it comes to discussing “Boston’s Best Burger.” An old friend to burger-lovers and carnivores who crave classic combinations such as delicious ½-pound, never-squished patties topped with bacon, blue cheese, tomato, coleslaw, and barbecue sauce, R.F. 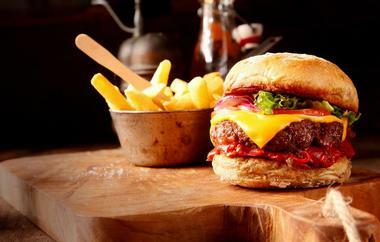 O’Sullivan’s offers over two dozen varieties of mouth-watering burgers. Each belly-busting burger is big with ½-pound fresh-ground sirloin patties cooked to the diner’s taste with fresh salad and crispy buns. Signature burgers include the Cape Codder, with fresh avocado and melted Swiss cheese, and the Black and Blue, coated in freshly ground black pepper and topped with blue cheese. Tasty Burger is a counter-serve chain with six locations in Boston that serves a variety of all-American fare, including burgers, sandwiches, hot dogs, and salads along with sweet desserts and beverages. Hearty burgers range from the classics such as bacon, cheese, and chili burgers to specialty burgers like the “Rise ‘n Shine” with fried egg, cheese, and bacon, and the “Gorgonzola” with crumbled bacon and melted blue cheese. Other appetizing dishes on the menu include crispy chicken sandwiches, beef hot dogs, freshly made salads as well as side items, including chicken nuggets, onion rings, and tater tots. 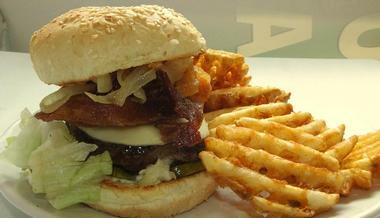 Tasty Burger offers catering services and large orders for parties. Situated near the spot where public hangings were conducted in colonial times, The Gallows is a trendy gastropub that serves delicious poutine (a traditional Canadian dish of chopped potatoes topped with curd cheese and a tomato-based sauce) and New American comfort food. This lively South End haunt offers creative lunch and dinner menus of gourmet bar bites, boards, and burgers accompanied by a vibrant bar scene with an inventive cocktail list that includes original concoctions and liquor infusions with old-timey ingredients such as mead and whey and a fantastic Sunday brunch. Try the Southern Comfort Burger with Buffalo smoked pulled pork, coleslaw, and American cheese. The Wheelhouse is a mellow, café-style eatery on Broad Street that is open for breakfast and lunch and offers a menu of delectable cuisine in an inviting setting. The breakfast menu features freshly baked muffins and pastries, yogurt parfaits, and breakfast sandwiches and burgers, while the lunch menu offers a variety of burgers, house sandwiches, and sides. Classic burgers are made with pure ground beef and various toppings, including bacon, fried egg, different cheeses, and homemade salsa, while the alternative burgers have patties made from lamb, turkey, and black beans. Crispy salads and freshly baked buns finish the burgers off to create a hearty meal served with crunchy fries and accompanied by a range of beverages. 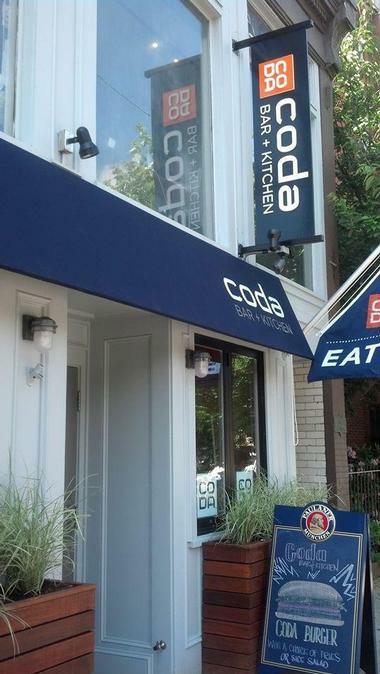 Located in Boston's South End just down the street from historic Copley Square, Coda Bar & Kitchen has been serving a rotating selection of American comfort cuisine along with local craft beer, Old World wine, and creative cocktails for 10 years. Open for lunch, dinner, and Sunday brunch, the restaurant offers a menu of freshly prepared fare using ingredients sourced from local farms, markets, and producers. Signature dishes include hangar steak frites, duck breast, pork tenderloin and the Coda Burger, with a choice of American, cheddar, Swiss, or blue cheese, bacon, avocado, and herb fries. Meals can be paired with a selection of fine wines, cocktails, and craft beers. A longtime landmark in Boston's Financial District, Brandy Pete's is a well-established restaurant that has been serving patrons since the end of Prohibition in 1933. 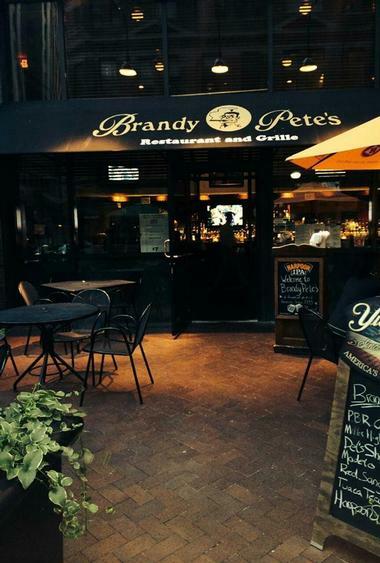 Located on Broad Street and named after founder Pete Sabia, who was an avid brandy drinker, Brandy Pete's serves a comprehensive menu of delicious fare and traditional beverages. Offered at lunch and dinner, the moderately priced menu features salads, sandwiches, succulent steaks, and entrées in the evening, including beef and turkey burgers, steak sandwiches, lobster rolls, and famous clubs. The signature burger at Brandy Pete's is the “Hangover Burger,” which is stacked on a toasted English muffin with a fried egg, smoked bacon, thick slices of American cheese, and maple-black pepper aioli. 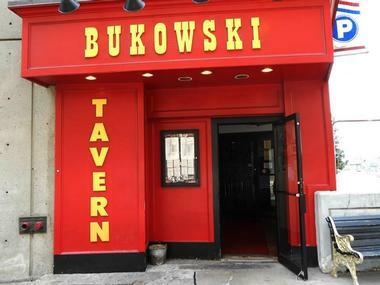 Named after America’s literary “laureate of the lowlife,” Bukowski Tavern is a traditional tavern and beer aficionado’s paradise with two locations in Boston and Cambridge that has been serving local and international beers and Americana-style cuisine for nearly 20 years. The sloshy dive bar attracts students, hipsters, and blue-collar types alike and boasts dimly lit interiors, blaring rock music, and walls lined with beer bottles. The impressive beer menu, which features everything from ales and lambics to bacon-flavored German rauchbier and exotic Japanese sake/ale hybrids, is accompanied by a pub-style menu of American fare, including chicken wings, steaks, burgers, and three-bean chili. Cafeteria Boston is an aptly themed eatery that offers a modern interpretation of classic American dishes in an old-school cafeteria setting. The menu features soul-satisfying classics such as tacos, pizza, sandwiches, burgers, and steaks along with freshly prepared salads, homemade soups, and various sides. Burgers include the “Boston Cream Burger” with grass-fed beef, cheddar cheese, sautéed onions and habanero-radish cream cheese and the “Black Bean Burger” with refried black beans with onion, red and yellow peppers, salsa verde, and chipotle mayo. The cuisine can be enjoyed with a variety of beverages, including wine, and the café is open for lunch, dinner, and Sunday brunch. 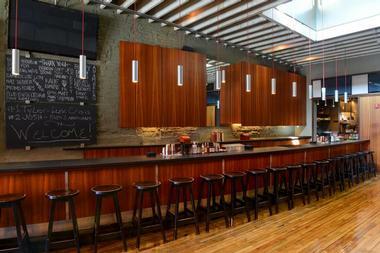 Griddler's Burgers & Dogs is a modern counter-serve eatery that serves classic fast food fare and drinks. 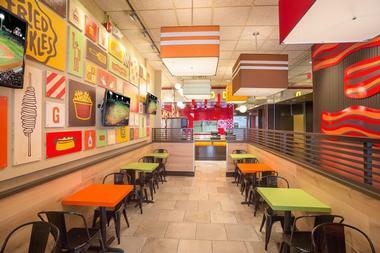 The new flagship location on Boylston Street offers a menu of fresh updates on classic American fast food, freshly prepared and made with locally sourced ingredients, including a selection of burgers like the quarter pounder OG Griddler with house Griddler’s sauce and Grillo’s pickles, and hot dogs with all-beef Old Neighborhood franks. Griddler's also offers a “Build Your Own Burger” menu that allows diners to get creative with their own choices of beef, chicken, or vegetable patties and toppings of kimchi, guacamole, tomato-jalapeño marmalade, all-beef chipotle chili, Cajun ham, and truffle aioli. McGreevy's Bar is a long-standing Irish pub and sports bar on Boylston Street in Boston that is home to a baseball museum and local band, the Dropkick Murphys. 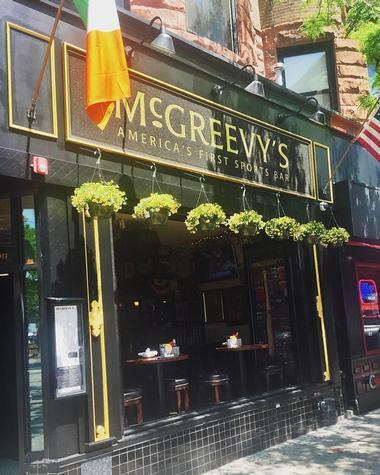 Designed to echo the original 3rd Base Saloon, which was shut down during the Prohibition Era in the 1920s, McGreevy's Bar was reopened in 2008 and has been a favorite haunt for sports fans, beer aficionados, and businessmen alike ever since. The menu features a variety of appetizers, freshly made soups and salads, sandwiches, burgers and entrées, and decadent desserts, along with an extensive list of local and international craft draft and bottled beers, fine wines, spirits, and signature cocktails. Porter's Bar and Grill is a casual eating and drinking establishment in Boston's West End that serves beer and pub grub to the pre-game TD Bank Garden crowd. Open for lunch and dinner as well as drinks, Porter's is popular with visitors wanting a bite to eat and a drink before watching the big game at the Garden. 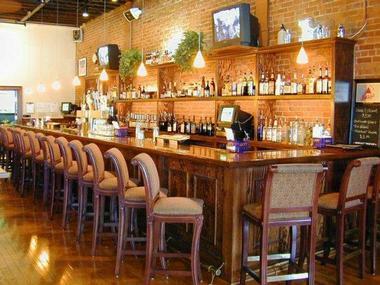 The neighborhood bar-style menu features classics such as chicken wings, juicy burgers, and pizza as well as off-the-beaten-track dishes like sausage cacciatore and tuna melts, along with an extensive list of local craft beers, wines, and made-to-order cocktails. Porter's is also open for the late-night drinking crowds. 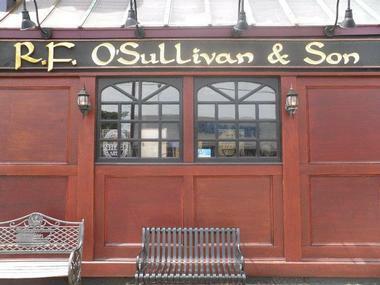 Located on Castle Island in Pleasure Bay, Sullivan’s is an old-fashioned concession stand that has been selling hot dogs and fresh fried seafood for over 60 years. Seasonally open 7 days a week from the last weekend in February to the last weekend in November, Sullivan’s serves breakfast, lunch, and dinner. 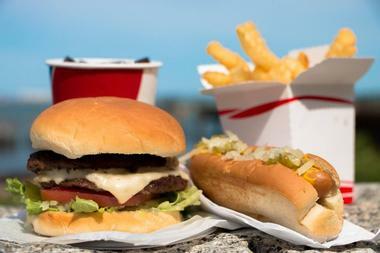 The menu includes a variety of fried seafood, such as clam bellies, scallops, shrimp, and traditional fish and chips, hot dogs and chili dogs, sandwiches, and burgers (regular and cheeseburgers) with fries and sides. Sweet desserts can be enjoyed after the meal and a range of drinks are also available.